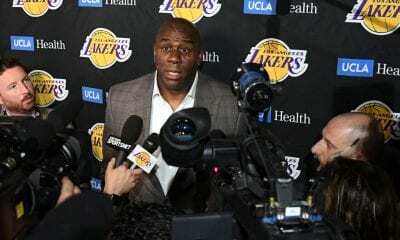 LeBron James has spent an inordinate amount time in Los Angeles bringing some of the less-informed in Lakers Land up to speed. For instance, The King has already been asked if he had to earn the respect of the Los Angeles fans. What? He was also asked if he would have trouble balancing his off-the-court business interests with his play. Duh! Seriously, have these people been paying any attention at all since he scored 25 in his first NBA game against Sacramento in 2003? That’s when the harp and his halo first appeared by scoring the most points by a prep-to-pro player in his league debut. Respect this: Nothing bothers James, other than people who doubt him or ask him stupid questions. 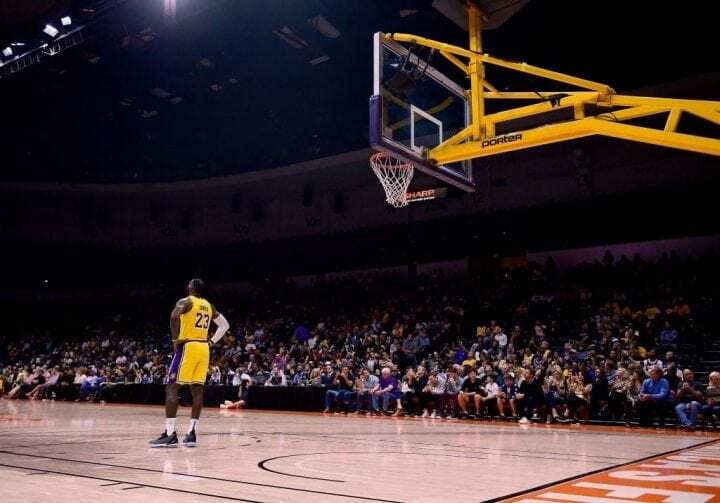 And so it went again on Sunday when James made his preseason debut with the Lakers against the Denver Nuggets in San Diego. The next four years in Hollywood will most certainly be as intriguing as they are entertaining. But if it’s the entertainment you are interested in, James got it going quickly by scoring his first points in gold on a 26-foot three off an assist by a former prominent antagonist, guard Rajon Rondo. The Lakers lost by 17. Don’t get used to it. You don’t win four MVPs by being on the short end very often. As usual, the most important aspect of this latest transition will be watching how quickly, and with how much humility, Lonzo Ball, Brandon Ingram, Kentavious Caldwell-Pope, JaVale McGee and Josh Hart defer to the greatest player of all time. Then again, that depends on your point of view. Just ask Cleveland about him. James only played 15 minutes, all in the first half, which was probably 15 more than he needed to play to get him ready for the season. 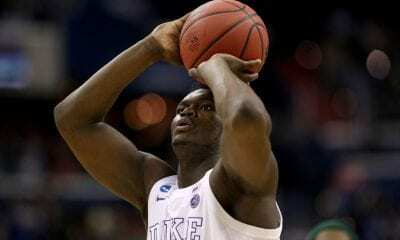 He scored nine points with four assists and three rebounds. But he already has made an impact. Los Angeles led by a point when he was subbed out with 3:02 left in the first period. They trailed by 13 when he reappeared midway through the second. Lakers fans will get their first look at James on Tuesday when they play another game against the Nuggets at the Staples Center. What’s certain is that it’s going to be very fashionable again to sit courtside, like in those Magic days at The Forum when Jack Nicholson and Dyan Cannon snacked in syncopation. There is reason for exhilaration. James has played in the NBA Finals eight years straight, most times carrying teammates on his back on the way. Meanwhile, the Lakers are not the Lakers anymore. They won 35 games last season, the most since 2012-13, when they last went to the postseason. They haven’t played in the NBA Finals since winning their second straight title for Phil Jackson in 2009-10. The investment in trying to change that was the $153.3 million over four years they handed James. But James has been understandably cautious about making public predictions about this season. 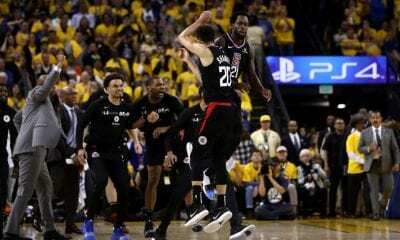 There is a very good reason – the Golden State Warriors, who beat James’ Cleveland Cavaliers in the Finals three of the last four seasons, losing only one game in the process over the last two. In the meantime, not much has changed. If you were among the 13,500 there Sunday, you would have seen a familiar site just before the opening tap. James walked to the scorer’s table and tossed his little cloud of talcum powder into the air. Oh, one other thing: The New York Times said James left San Diego in a private helicopter that had been idling in wait. It’s Showtime again in Los Angeles.